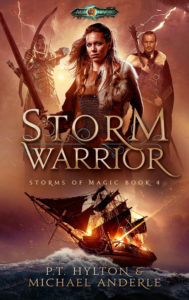 Salt and sea, It’s almost time to release Storm Warrior! We’ve just got time for one more snippet and one more clue. So we’ve got a fire, a shadow, and a city wall. Make of that what you will. Now on to the story! “An Arcadian, two Barskall, and the captain of the Holdgate city guard walked into the woods. Sounds like the beginning of a damn joke.” Roald’s voice dripped with disdain, as if he couldn’t believe his life had come to this. Roald just shot him a look. Fannar tried not to take it personally. 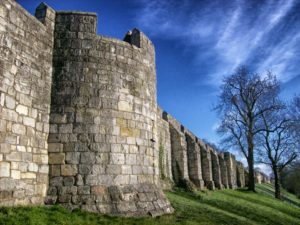 He’d been in Holdgate nearly three weeks now, and in that time he’d grown accustomed to the strange looks he got while walking down the street. Not from everyone, since there was nothing about his physical appearance that made it obvious he was a Barskall, though he was a bit shorter than most men in the city. But people talked. It was one thing to have Barskall Storm Callers on the stormships. The people knew the Storm Callers had been held against their will and forced into servitude by King Elias. But having Barskall warriors walking free in the city was something else altogether. And Fannar wasn’t the only one. While most of the Tall Grass Raiders had elected to return home to Barskall after their escape from Gren, Hekla and Sigmund had decided to stay with Elliot. Three Barskall warriors now walked the Holdgate streets. For Fannar, it was still a time of trying to figure out where he fit into things. He wasn’t a sailor. Perhaps with time he’d be able to learn, but even the thought of a rocking sea made his stomach roll. He was a fighter. So it was that he found himself out patrolling the woods east of Holdgate with Benjamin, Hekla, and Roald, the captain of the Holdgate city guard. It had been Benjamin’s idea, of course. They knew Barskall warriors were hidden somewhere out here waiting for their chance to strike, so why not use friendly Barskall to find them? They’d been walking for a few hours, investigating a number of tips from local lumbermen about possible Barskall sightings in the area. So far they’d come up empty. Fannar glanced at Benjamin. The blacksmith had been silent almost the entire journey. It was clear he wasn’t a big fan of Roald, but the Holdgatesman seemed oblivious to everything but his own disdain. Despite the crude way he said it, Fannar agreed with the sentiment. The Barskall would have brought a limited amount of seiderdrek, and they had to be running low by now. They’d save a supply for their big attack, but it wouldn’t be easy. Fannar knew from experience that the drug was almost impossible to resist. Ever since he’d drunk it during the fight at the palace in Gren, it had been in the back of his head like a strange song, calling him to find more—anywhere. He hadn’t spoken about this craving to anyone, but he knew that if he’d had any seiderdrek on hand he wouldn’t have been able to resist it for long. They approached a small clearing just off the trail and found the remains of a campsite. The logger they’d spoken with had reported a group of ten men who’d camped there two nights previously. He’d claimed they were Barskall, but Fannar was skeptical. After all, how would he know that just from observing the smoke from their fire? Fannar couldn’t disagree. He spotted the bones of three rabbits that must have served as a meal. She held it out to Roald. Fannar was shocked to see it was a rolled piece of parchment. Roald’s face was grim as he read the parchment. When he finished, he wordlessly handed it to Benjamin. The blacksmith looked no more pleased as he read. “Well, that answers the question of who camped here,” Benjamin said. He handed to the parchment to Fannar. The Barskall’s eyes immediately went to the beginning of the block of text on the page. Then they went to the end. What he saw made him grimace. Okay, that’s it for the snippets. See you Friday for the book release!